The Protein Bakery : We've found the secret to happiness: Balance. So, we know the value of weights and measures. We chose the name Protein Bakery, for a good (and healthy) reason. 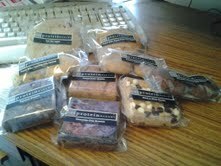 Muscle-building protein is a huge component in all our delicious cookies, brownies, and blondies. Protein makes you feel fuller faster and prevents spikes in blood sugar levels. It's one way to keep the heart beat steady and the body in balance. Every delectable, guilt-free bite is high in dietary fiber, low in gluten, and delivers up to 5 times more protein than the average baked treat. Our trans-fat free, preservative free, and wheat flour-free recipes are also nutritionally balanced. We combine natural ingredients like heart-healthy rolled oats rolled oats, light brown sugar, and the finest chocolate. We bake small batches from scratch every day. With the same attention to perfection as we did on day 1 in November, 1999. Our 20-plus flavors of creative culinary confections boast gourmet accents like swirls of rich peanut butter, tangy cranberries, toasted walnuts, sun-sweetened coconut, and so much more. (Read More) . 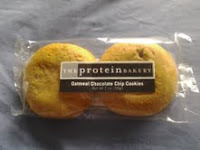 I was so excited when I was offered to do a product review for The Protein Bakery about the time I was offered a review from them, I had been thinking about weight loss, diets, and nutrition. So this was perfect timing for me to try something new, but better than that.. Sweets that are good for you AND that taste good! Yes! Really! before my review products arrived at my door (photo) I started digging deep into other blog product review websites, and they had nothing but amazing things to say about the company and products. So that perked my interest even more. I was given 9 amazingly sweet products to review. And let's just say I was not disappointed. Chocolate Chocolate Chip Cookies : Mmm! Was the first thing I thought when biting into the Chocolate Chocolate Chip Cookies. The cookies are packed full of chocolate goodness. Sweet for the major sweet tooth's like me. I have had other protein packed deserts and they are bitter, and have an awful after taste. These are sweet, flavorful, and packed full of bitter sweet nuts. I loved dunking them into a cold glass of milk. My husband also thought they were pretty amazing tasting also. 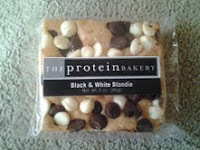 The Black and White Blondie : The Black and White Blondie has become a favorite of mine! the Blondie is not overly sweet but has a nice tongue tingle to it. Slightly crunchy, and has a cookie dough moistness. It's chewy and yummy. My husband loved it. I have never had a Blondie before now, and because of this one I will keep my eyes open for them. Between the Blondie, The white chocolate chunks and the milk chocolate chunks you have an explosion of flavors on you're tongue. Peanut Butter Peanut Butter Chip Cookies : The peanut Butter Peanut Butter Chip Cookie smelled like Easter morning. Growing up it was something my sister and I did growning up, we made peanut butter cookies Easter mornings. This cookie is packed full of all kinds of goodies. Big pieces of peanuts, creamy peanut butter chips, and yummy peanut butter goodness., The minute you eat this cookie it melts in your mouth. It's full of flavor and yummy stuff. I hate peanut butter. I always have, so when I find something peanut butter anything.. It's a sure and good thing. Oatmeal Chocolate Chip Cookies : The oatmeal Chocolate Chip Cookies are sweet creamy, and crumbly. They have an amazing oatmeal and nut flavor. The oat side is really crumbly but the inside is creamy and packed full of chocolate chips oats and taste oatmeal. These little babies will perk you up on some of your most lousy days. I would say these are the most amazing comfort sweet foods I have ever had. You wont want to put them down, and won't want to share. Peanut Butter Blondie : I have said it before, and I will say it again. I hate peanut butter but.. 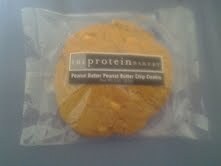 I have found a strange new love with the The Protein Bakery 's Peanut Butter products. The peanut butter blondie melts in your mouth and makes you wish it would never end. My husband halved it with me and he loved it also. 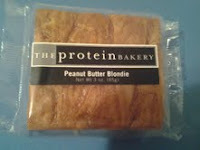 The blondie is sweet but not over whelming and the peanut butter lingers softly on the tongue. The chocolate peanut butter chips give it a nice crispy munch. I'm on a diet among with my husband and a more 16 cars per blondie is also nice on my diet when I'm craving something sweet. Trail Mix Cookie : I have never had a trail mix cookie before. But I can tell you it will not be my last. I loved the name and had a little giggle out of it, but when it came to the product they ment business. This cookie was loaded with all the good stuff you would find it a trail mix. Sweet raisins, and nuts, packed into a cute round cookie. we had our bitter sweet moments before saying good bye at the last bite. It knew that I would miss it, but also knew I would see it again. 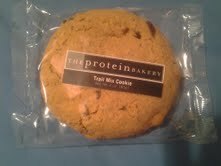 again when I buy another trail mix cookie because it was soo good! I just have to have another one. I was not disapointed!. Espresso Brownie : This has to be my all time favoarite! this sweet and chocolate brownie will take taste buds on a roller coaster ride. The soft brownie is not overly sweet, and has a good crispy crunch from the chocolate chips. You will never want the brownie to end. The bold chocolate flavor will satisfy any major sweet tooth. Chocolate Chip Brownie : Chocolate, Chocolate, and More Chocolate! This brownie is soft creamy brownie is packed full of chocolate from top to bottom. I don't know anyone who doesn't love chocolate. This brownie is full of dark chocolate goodness. 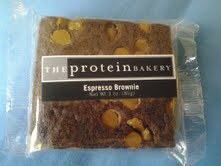 With only 18g of carbs for 1 brownie, it's nice on my low carb diet. This is the most diet friendly and amazingly sweet desert I have ever had! Thank goodness for such an amazing treat! you will love it. With a seriously tasty variety of sweet treats the The Protein Bakery has, you will sure find something you and the ones you love will love!. ♥ I receive no monetary compensation for this review. 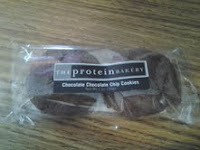 I was provided The Protein Bakery to try and give my honest opinion(s).